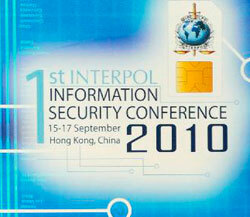 During a keynote at the first INTERPOL Information Security Conference, co-hosted by the world police body and Hong Kong Police, INTERPOL Secretary General Ronald K. Noble called for law enforcement worldwide to develop an international identity verification system. “Considering the anonymity of cyberspace, cybercrime may in fact be one of the most dangerous criminal threats ever. A vital component in fighting transnational crime must therefore include the policing of information security and the provision of secure communication channels for police worldwide based on common standards,” said Noble. INTERPOL is in the process of deploying a smart card, produced in partnership with Entrust, which will enable officers from any of its 188 National Central Bureaus to communicate securely from virtually any fixed or mobile location in the world.